Screenshot from YouTubeRay, left, and Tom Magliozzi, right. 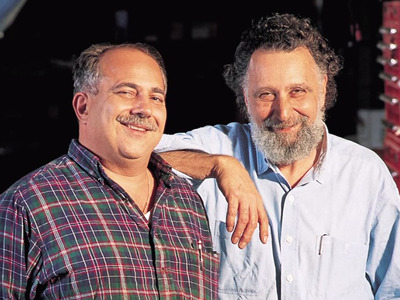 We just learned that Tom Magliozzi — who with his brother, Ray, spent several decades on public radio as one half of the “Car Talk” team — has died at 77 of Alzheimer’s Disease. Tom and Ray — “Click and Clack,” as they were know, or “Rusty and Dusty” to fans of the “Cars” movie — retired from weekly production of their show in 2012, but most listeners probably didn’t register the change, as the broadcast lived on in re-runs. “Car Talk” was really three things: A classic piece of public radio programming; a very good and funny show about dealing with car questions; and an absolute juggernaut in terms of listeners for NPR. A year before ending production, Tom and Ray were still bringing in almost 2.5 million listeners on the weekend. Cars content tends to skew toward young men. The cheerful mechanic vibe that the Magliozzi brothers brought to their show, due to their background actually repairing cars at their Boston garage, canted the demographic toward a slightly older crowd, nothing unusual for NPR, and consistent with a generational identification for men who liked to know how to fix stuff. But what really set “Car Talk” apart was Tom and Ray’s ability to appeal equally to men and women. Roughly 50% of their audience was female (Walrus Research crunched the numbers in 2011), and while the brothers’ loud sense of humour and at-time avuncular approach to women might have offended in less skilled radio hands, Tom and Ray never went there. Women who called in with problems were always respected and at times sent the brothers’ irreverence slinging right back at them. This was brilliant execution, made all the more brilliant by the fact that Tom and Ray kept it up, tirelessly, for so long. “Car Talk” had a peppy, talk-radio feel that didn’t sound like the rest of public radio, so it stood out (their willingness of cackle with laughter and their Boston accents helped). Because it was a call-in show, it was largely unscripted. This is a tough thing to do in radio, period — and particularly tricky in the NPR universe, where the audience has been trained to expect very high production values and nothing too crazy. The brothers kept is shaggy and kept it real, and by doing so crafted a pair of inimitable personalities — the coin of the realm in public radio — and actually dispensed a lot of excellent car advice. The female audience was the show’s strength, but so was how the goofy jokes and banter dropped away when it came time to tell someone how to deal with a car maintenance or buying decision. The bottom line was the Tom and Ray were trustworthy. Listeners came back for the entertainment value that the brothers served up, but they also returned for the same reason that you go back to a mechanic who doesn’t steer you wrong. NPR is running some choice outtakes from the show at its website, to accompany the story announcing Tom’s death. There’s also a good chance that you can listen to a show from the archive this weekend, if you’re driving around with you car radio tuned to an NPR affiliate that’s running the show. To live on in that way would probably make Tom very happy. He will be missed.